As a coastal city with a very long white sand beach, Nha Trang has so many advantages for tourists compared to other seaside cities such as Danang, Hai Phong or Qui Nhon. Unfortunately, Vietnam Airlines has a virtual monopoly on routes to Nha Trang which means it's not cheap to go there for a short vacation. Once you are there, however, it's very affordable. 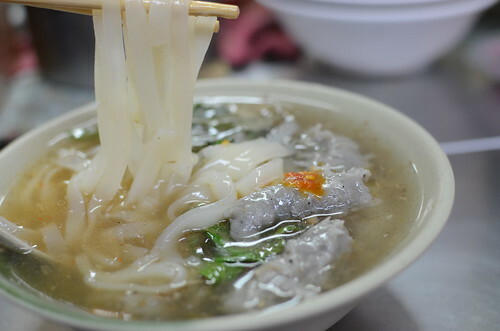 The city has excellent street food dishes alongside its famed seafood options. 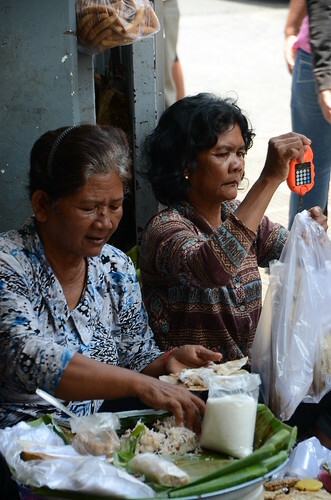 Most street food vendors in Nha Trang are specialising in dishes and snacks related to seafood. An example of this is banh khot (grilled pancake). Most people from the south make this cake but they usually make it plain or with eggs. 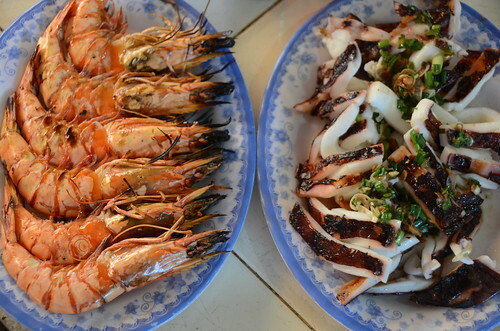 In Nha Trang, it is made with squid, shrimps and eggs as well. They serve banh khot with two sauces, mam nem and a special nuoc mam. Mam nem (fermented fish residue) has a powerful smell but great flavor which is the best for banh khot, and nuoc mam (plain fish sauce) is also a great option. Other ingredients in both sauces can include mango, pineapple, sugar, garlic, water and Nha Trang Sim chili. Nha Trang Sim chili is very famous in Vietnam because it's not very big, has a very hot taste and fragrant aroma. When making banh khot, the batter is poured into lightly oiled griller cups over a coal brazier. Once the batter starts to bubble, the squid or shrimp or egg (or all three!) is added on the top, taking a few minutes to cook through. To make this cake sounds very easy but it requires a lot of preparation, especially cleaning up the seafood, make the dipping sauces and the fuel up to the coal braziers. 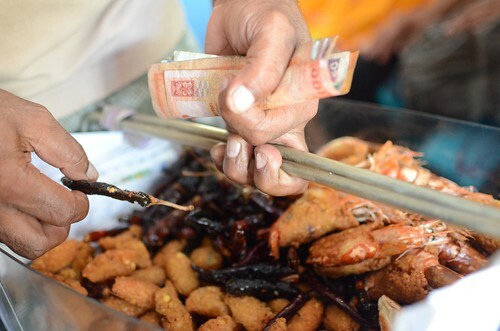 Banh khot is a popular street food snack in Nha Trang, with most people eating it as a late afternoon snack or after dinner for supper. It's actually quite filling and heavy if you have about 8 or 10 of them with egg. In Nha Trang, the best vendors are along Le Thanh Ton Street and at the beginning of 2/4 street, opposite the Cham Towers on the way out of town. Why are you going to Anamaduwa? 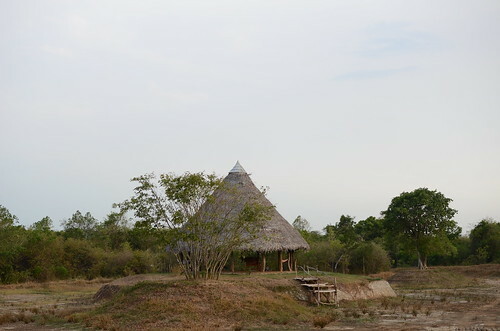 That's a poor and dry area of Sri Lanka and nothing to do and there's no hotels! Quite a few people kept asking the same question. I explained to them I wanted to see something different, close to nature and that it was the place where you can live without technology and electricity. Anyway, after 3 and a half hours in a tuk tuk with a great old driver who told us different stories about his life in Sri Lanka. We stopped in between to get some coconut and boiled corn. It was very nice of him to negotiate the price for us and certainly they were really cheap. The coconut was amazingly sweet and good. Finally, after reaching the township of Anamaduwa, we transferred to a van to take us a little further to The Mud House . We were greeted by the very smiley manager and staff which I needed after the long drive. Beni showed us about the place and the facilities. For a city boy like me, this is really different and I think this is probably the perfect chance to experience something unique. Lunch will be served in 30 minutes, Beni told us. I lay down on the mud bed with soft mattress and fell asleep. 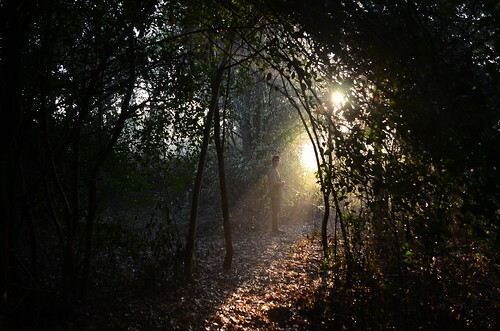 After a while Beni said hello near the bed and I apologised for keeping him waiting and I rushed into the natural bathroom covered by trees and probably wild animals could see me. It was great having a shower to make me feel so fresh and clean. We walked about 2 minutes and Beni introduced us to the restaurant staff who provided a very nice lunch made from the organic produce from their garden. I love that idea so much. We didn't need to worry about the menu and what we were going to eat at night. Surprises are always great. There were lots of activities to participate in during our 4 days here. We started with Beni walking us around the place to their garden, kitchen and also the different mud houses. It's great to sit down to read a book and drink a gin and tonic that we brought ourselves from Kandy which was incredibly expensive ($45). The next day, we rode our bicycles to the pagoda with Beni riding his Honda Cub. It was fun and we walked up to the hill to see amazing views of the surrounding area. 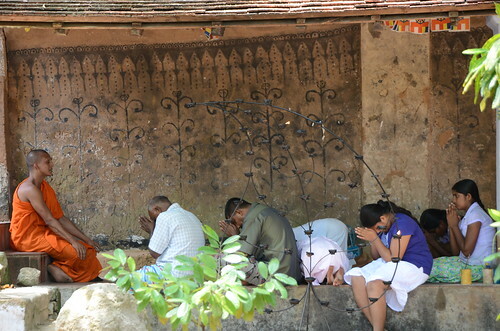 Then Beni took us inside the temple and explained about the history. We enjoyed the morning very much which included some exercise and culture. We headed back to the Mudhouse just before lunch after which we had a cooking class with Mr Guna and Mrs Ukuamma. We made two curries with long beans and gourd. Very tasty!!! The great thing that Sri Lankan cuisine is that don't cook all of their curries with oil and that makes their food quite healthy. We decided take it easy the last day after our morning of birdwatching. A big rainstorm occurred in the afternoon that make me really excited. The thunder seemed louder in the middle of nowhere and we run into the rain for a quick shower and it was so fun. It brought back so many memories from my childhood when we showered in the rain naked and ran up and down the streets with our friends. Great feeling!!!! This is the last stop on our Sri Lanka trip and it has been a truly memorable place to be!!! 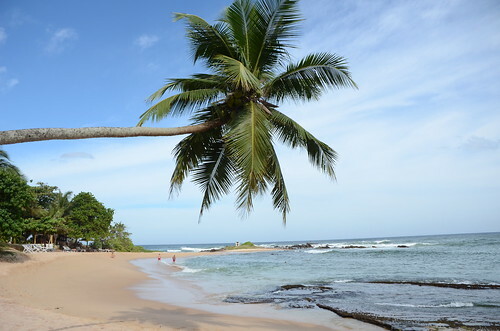 Tangalle is a very small beach town about a 1 hour drive from Mirissa. We decided to spend another 3 lazy days on the beach before heading to the mountain town of Ella . The town itself has a small market and few shops along the main street but the beaches are the main attraction for travellers. We stayed at the Eden hotel which is located on the main road outside the city and close to the small beach coves around. This is a little hotel with great service, breakfast and delicious food for lunch and dinner. Apart from the time we were out on the beach, we spent most of time reading and having our own gin and tonics in the garden. The owner didn't mind giving us lime and ice as we bought tonic from the restaurant. The small beaches nearby the hotel were beautiful though we needed to watch where we swam as there were a few rocks underneath. 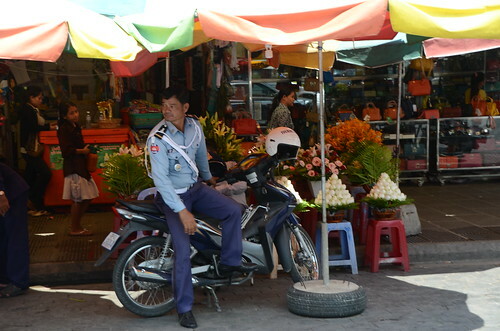 One morning, we took a tuk tuk down to the city to visit the market and take some photos. The sellers in the market were so friendly to us, always smiling and greeting us. I don't think they are very used to foreigners visiting their stalls. We took away some freshly ground spices to make curries back in Hanoi. After our time in Tangalle, the hotel owner offered to drive us to Ella, a 4 hour trip. He's a very careful driver and also pointed out things of interest along the way. 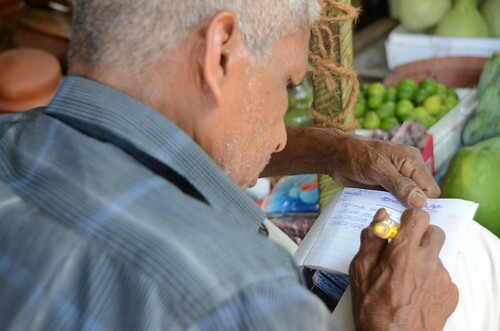 It is great to learn by getting insight from the local people rather than from guidebooks. 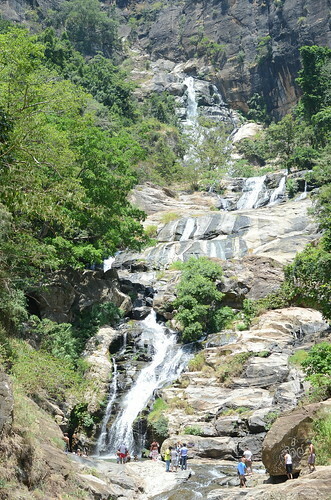 We arrived in Ella, famous for waterfalls and trekking and as a gateway to Sri Lanka's tea plantations. 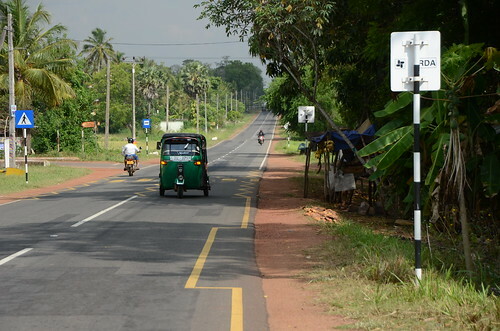 Ella is another small town with one road about a km long unless you walk along the rail way to see the local farms. 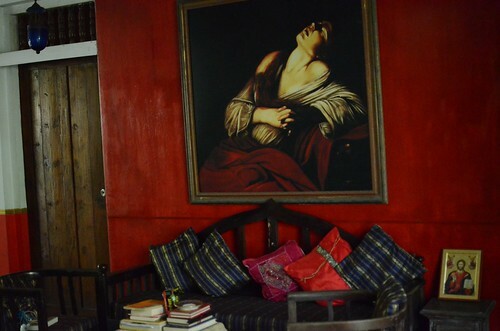 We stayed in a small hotel which was highly recommended by travelers from agoda. After refreshing a bit, we walked out to check out the town and found a small restaurant next to the hotel and the boy served us beer in a tea pot as they don't have a permit to serve alcohol. It was hilarious when he first came out with the pot and explained there was beer with ice in there. They cooked fresh curry to order even though we had to wait a bit but they were so tasty. I don't mind waiting for great food. I wasn't so fond of Ella compared to the places we'd visited earlier. There was not as much choice for food and sight-seeing here. Anyhow, we left for Kandy - which is quite a big city in the middle of Sri Lanka - for one more night before going on to our last special place. In hindsight, I wish I could have stayed 2 nights as we stumbled across a great small hotel with a fabulous view over the lake, which reminded a bit of Hoan Kiem Lake in Hanoi.. We went out for a wander and liked the atmosphere very much. 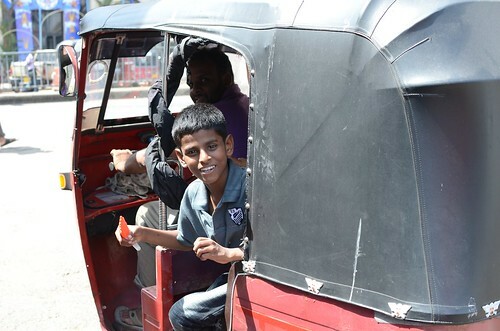 People in Kandy was also very friendly. 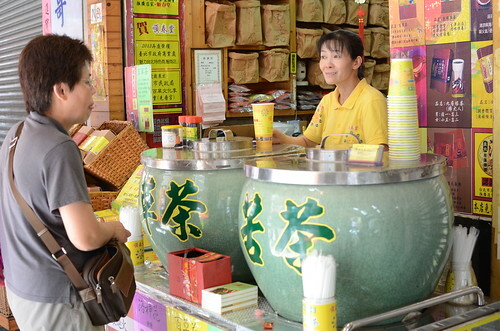 We bought tea at a traditional tea shop as well as some spicy snacks to eat with beer. The traffic was a bit crazier compared to other places but they all stop for pedestrian crossings, unlike Hanoi. We rushed ourselves back to the hotel as a big thunderstorm approached. It was great having dinner, looking at the city view with lightning and thunder. I love this kind of ambience. Three days and four nights wasn't enough for me to eat all of Taipei's specialties. With my limited command of Chinese, I made people laugh a lot with my Vietnamese accent and half of the time they didn't understand me at all. But it was fun and I'm glad that I made the effort. One thing I was wondering about before the trip was how I would be treated by my Asian neighbors. It's always a little bit awkward because in this region, people assume that I am from their country and are quite surprised when I can't communicate. I need not have worried because the people from Taipei are amongst the most friendly I've ever met in all my travels. I think I need come come back and spend at least two weeks to walk around for both sightseeing and eating as well as to see other parts of Taiwan. 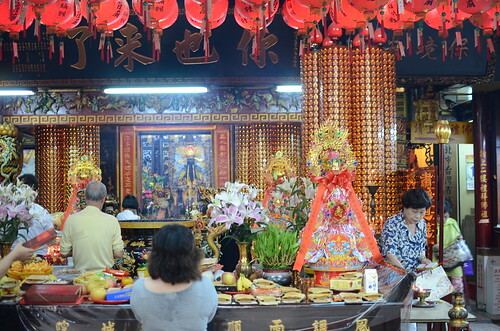 On this trip, I didn't spend much time visiting tourist areas at all except for the Longshan temple. On the food front, however, I probably spent too much time! There are so many dishes to try and, because I'm Asian, the rice and noodle base never gets boring. Some Chinese Taipei dishes are a bit similar to Vietnamese dishes but I think it's more about BBQ and stir frying. 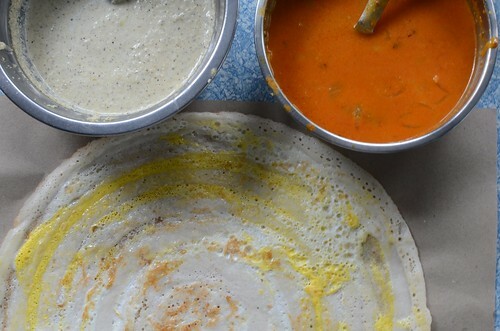 It doesn't really matter which way the food is cooked as long as it tastes delicious. Perhaps my favorite dishes (from a long list!) 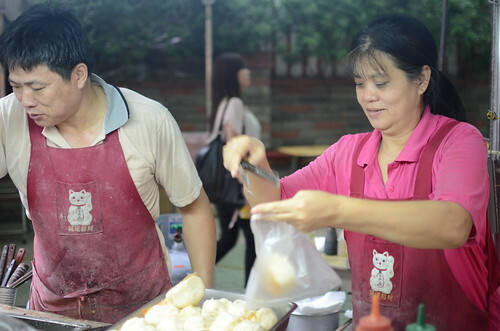 were the squid noodles with thick broth and Asian basil or Guobao which is another version of steamed bun. The weather wasn't that great but it didn't stop me wandering around to try Taipei moon cake and at the Astoria cafe, I had their famous Mazurka cake and coffee. At their retail outlet I also went a bit crazy, taking away a great Portuguese Pasta de Nata and a creme brûlée. I think one of the best things about sweets in Taipei is that they are not too sweet like they tend to be in Vietnam. I need to send special thanks to Robyn and Dave for all of their great recommendations to eat and stay in Taipei. 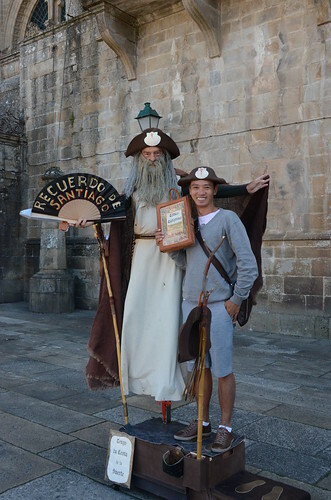 Their blogs continue to give me lots of good tips for my travels. 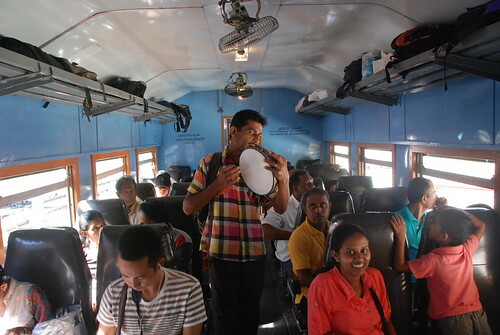 Yet another 3 hours local train trip but this one was less crowded compared to the short suburban one in Colombo. I sat with a Sri Lankan family who didn't mind letting me sit next to their daughter, the father talking a lot in his limited English combined with body language. We had fun conversations with lots of laughs. This train trip was full of interesting passengers, especially the ones selling food, who jumped on for a stop or two before getting off again. I bought quite a few snacks including shrimps, fried corn fritters and peanuts and chick peas with curry leaves from these sellers and they were very tasty. 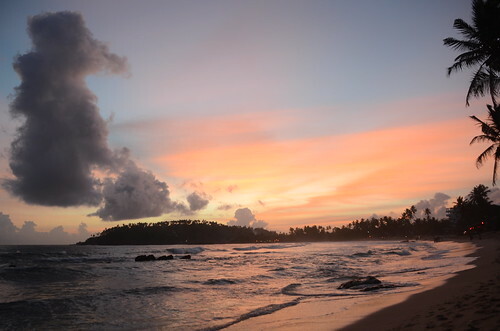 After alighting from the train in Weligama, I travelled the short 6kn to Mirissa to our accommodation, the Sunset Guesthouse which is located right on the beach. The hotel rooms were very basic with a slight plumbing problem from time to time (pooh!) but they had a fantastic chef, super friendly staff and very cold beer. There's nothing quite like enjoying a beer on the beach on holiday. Sometimes I had two! I walked along the beach in the late afternoon to try to find something to eat. There were quite a few restaurants and bars on the beach but nothing compared to the food at the hotel, even though the environment at the other places was nicer. This is often part of the experience of travelling, I find. Dinner was fabulous from the hotel restaurant which cost $6 for 6 different curries and they were all really tasty. 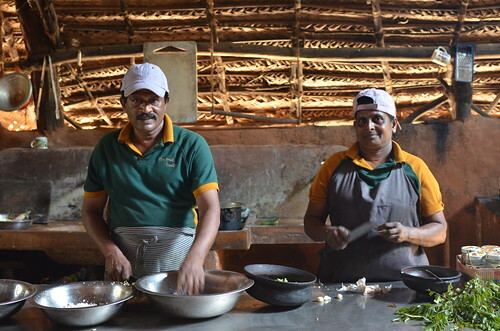 The chef told me that the curries are freshly cooked to order and I think that's the best and what makes it different from other places in Mirissa. The range of curries, especially the vegetable ones, was incredible. Over our five night stay, even though we were often having the veg curry option, we tasted so many different curries, including okra, snake beans, eggplant and pumpkin. While I wasn't eating and drinking, I was walking the beach and watching the sunset. 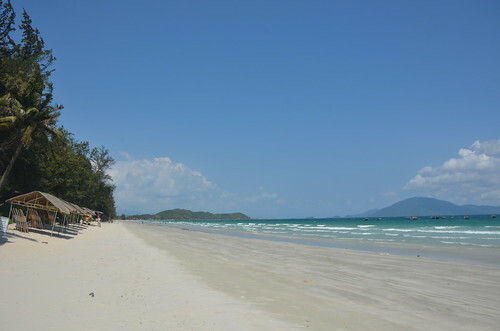 It's indeed a very nice beach, and reminded me a bit of Phu Quoc beach or Doc Lech beach in Vietnam. 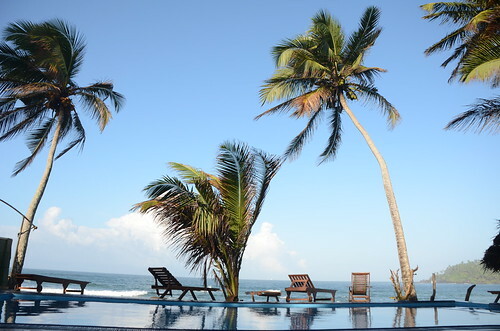 Mirissa is a great place to just chill for a week or so. I will definitely be going back! After 2 delays in Hanoi and another 2 delays in Bangkok , finally, I arrived in Colombo at 1.30 Am local time (3 AM Hanoi time) Sometimes what seems to be a relatively short flight in the region ends up a full day of travel. I felt sorry for the driver waiting for me at the airport but he met us with a very nice smile which took my exhaustion away. After a short but lovely welcome to our hotel at Mount Lavinia, the next morning I walked along the beach after a very big fresh fruit and small omelette breakfast. The hotel is about 5 minutes walk away from the beach and hardly any tourists around. There were lots of people playing cricket on the different ovals but no one playing tennis on the sandy courts which made me wonder. 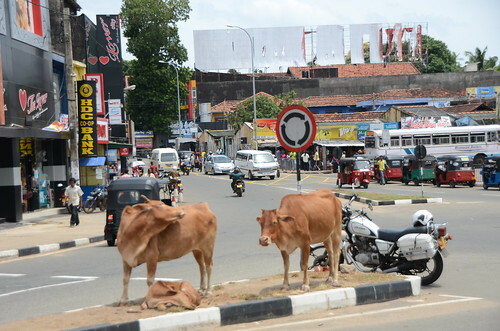 So far Sri Lanka has proven a very reasonable destination for both food and transportation. 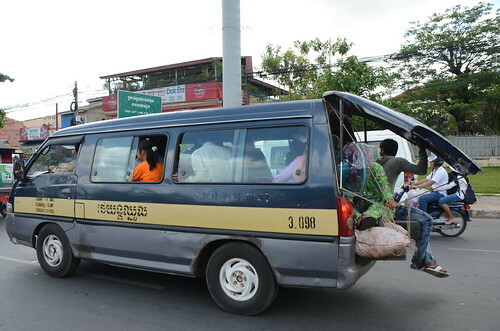 Most trips in the ubiquitous tuk tuk costs about a dollar and the drivers usually offer the real price and drive very carefully. I'm not a bit fan of heavy food and I expected Sri Lankan food to be heavy but I've been pleasantly surprised by the great vegetable curries and fresh fish dishes, which have been the highlights so far. 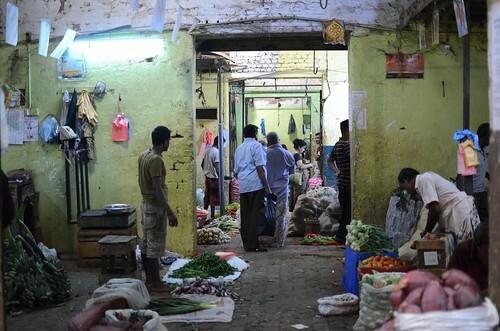 I went to the Maning Market, Colombo's main wholesale vegetable market, after a crazy crowded local train trip. I was a bit worried about the passengers hanging out the door and it is amazing how many people can be stuffed into a train carriage. 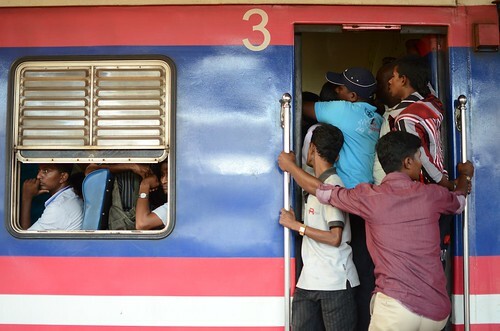 The worst part was when the train arrived at Colombo's Fort railway station and I wanted to get off but I couldn't because people were pushing to get on the train at both doors. At the last minute, I managed to jump onto the tracks on the wrong side and climbed up onto the platform on the opposite side. It sounds crazy but that's what most people do here in Asia and I felt fine at the end. The good thing here in Sri Lanka is whoever I meet on the train or on the street, they always smile and come up with a conversation or give me a hand with directions which I love. Walking toward the market right near the train station was a bit of a worry at the beginning as there were so many buses, the bus station being next door. Thanks to the lady who pointed me in the right direction; the Manning Market is an amazing market where I saw only male vendors with big smiles who offered me their fruit to try with no hassle and also asked me to take photos of them. I will definitely send them their photos as they also gave me their shop address. 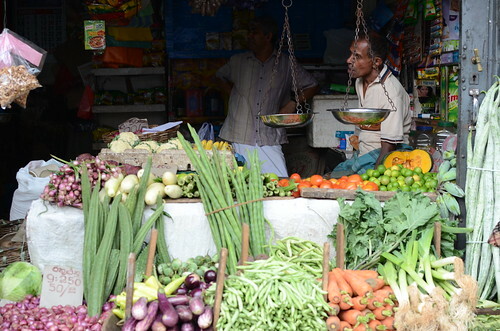 I'd never seen such beautiful fresh fruit and vegetables in what seemed like a very quiet market. I wonder why all the sellers are men, which is very different to the situation in Vietnam. Anyway, I had a fabulous time and it is definitely a highlight of my trip to Colombo and I wouldn't mind going back to this market again. 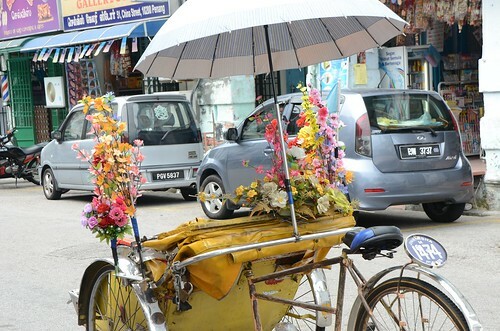 I have been to Malaysia several times for short vacations and I've always enjoyed it very much. Finally, this time I made it to George Town, a UNESCO listed town in Penang to visit friends and also to try some great food. 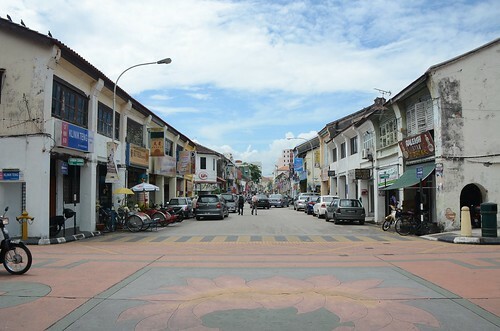 I loved George Town immediately because of the old houses, small streets and food everywhere. I'd say this is a food town as food stalls are prominent everywhere; from Indian, Malay to Chinese food and the PROBLEM here is they all delicious. My friends who have a very delicious food blog (Eating Asia) took me eating around George Town to their favorite places. I feel very fortunate to know Robyn and Dave not just because of their food expertise, but also because of how I got treated and learnt so much from them, about photography and about food. It's really hard to pick the best dish in Penang as I love them all. You probably have your choice but for me they were all fabulous. For me street food served on the street or in a small stall is the best. It's really my type of dining and I never have any issues eating on the side walk as I know and see what I'm going to eat, which is fresh and well cooked. It's a bit similar to the street food in Hanoi but probably heavier with lots of stir fries and curry with noodles. Probably my favourite meal was from the lady who sells a small buffet of Nyonya dishes one of the main food markets. The highlight was a fantastic fish curry with lots of fresh chilies. I love her life story (in one of Robyn's recent blog posts) and loved her big smile and friendliness. 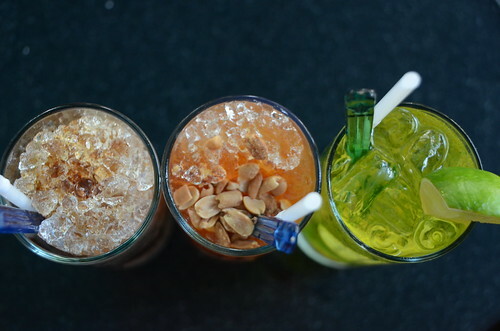 We also drank white coffee, similar to Saigon's style with lots of crushed ice which is kind of addictive. After a few breakfasts, a few lunches and a couple of dishes for dinner per day, it was essential that we walk around George Town's small lanes to try to create space for more food the next day. It definitely pays to be led by experts. Not one meal or snack opportunity was missed. But I do need to go back George town for more. I had a ball!!!! Working as a food tour guide, I have so many chances to meet different people from different nationalities everyday which makes me feel like I'm traveling around different parts of the world daily and also learning so much from my clients. 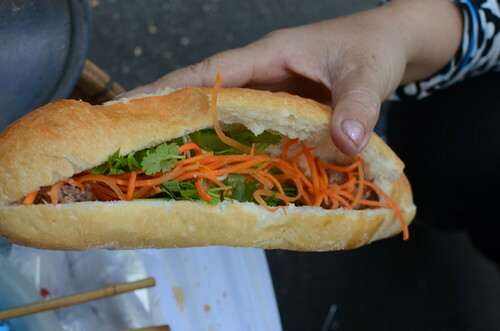 It's so hard to nominate my favorite clients or my favourite nationality because most of the people who make a booking with Hanoi Street Food Tours are food lovers so we have an instant connection. It's like we speak the language of food. I would never say that I teach my clients about food but I do show them what is special from the city I love, Hanoi, even though I'm not from here. I suppose I'm the one who helps them to understand more about Hanoi food. I enjoy working everyday and I'm pretty much always excited about going to work. Many people think it is a very easy and relaxing job where I simply eat, drink and talk to earn some money. But from my experience, you need to have a genuine love for people and food, plus a determination to keep every tour upbeat and special for every client. 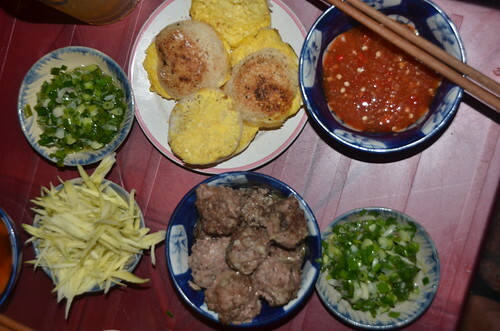 The tours are not only about eating around Hanoi, but also is about the culture around the food. In Vietnam, we love to eat but we eat in a very healthy way! My clients regularly ask me "Why are Vietnamese people so skinny because it looks like they eat and drink all the time?" The answer is that we eat healthy food with lots of herbs and veggies. 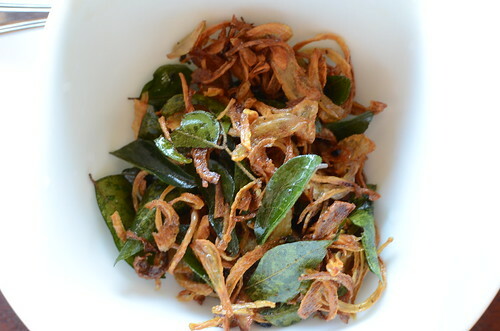 We are also meat lovers but we always balance meat with steamed or sir fried veggies and pickle fruits. And another very important factor is we do heaps of exercise everyday. For my job I frequently work 3 to 6 hours a day, 7 days per week and sometimes, I have to walk around the city eating for 9 hours a day. For exercise, I do a bit of running around the tennis court trying to use up the calories and maintain my weight. At the end of the day, I have to admit that I love eating and I would never complain about hard work. I am a very lucky guy to be able to work in my desired field compared to million of people around the world without jobs or un happy with their jobs. I try to live by the saying "Work Hard, Play Harder". Before my first visit to Phnom Penh, most of my friends warned me about the heat but it was not too bad. I like walking around the city and sweating a bit to feel the city and see how local people live and survive in the conditions. It's not that hot compared to Hanoi in the summer time where the heat can be reach up to 40+ degrees. 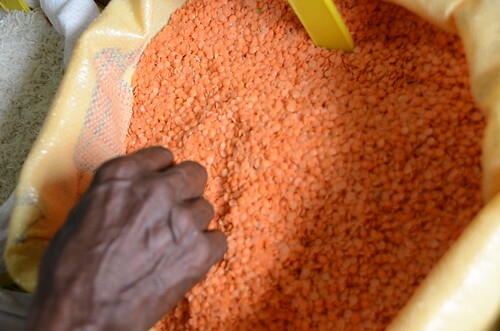 I especially enjoyed visiting the wet markets in Phnom Penh as I think that's the best way to experience the rhythm of the local people, as well as to see amazing produce and food preparation.The markets in Phnom Penh are well maintained and very clean compared to other Asian wet markets, even Hanoi's. Sitting down and eating in the middle of the market, I can see how people cook my noodles, BBQ or cakes. 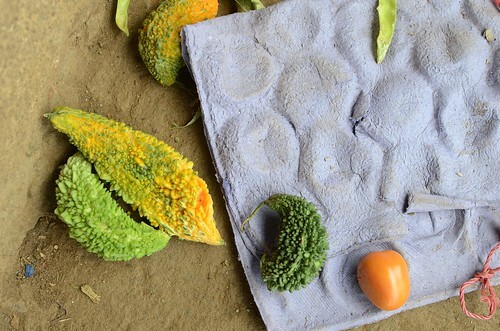 Veggies and fruits are well arranged too, and so colorful. I don't enjoy eating in restaurants as much as eating on the street. 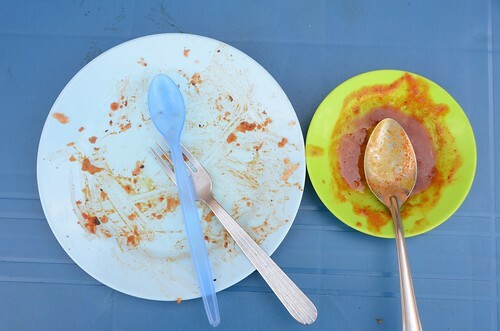 Of course, there are always streetfood places that don't look that great or clean but I just avoid those places, for example anywhere located next to big rubbish bins or on the side of major roads where you can see all the dust flying into the food. Interestingly, I tend to get food poisoning more at restaurants than at street food stalls. It happened again this time. That's my lesson and my tip is that the best and most authentic food is served and prepared on the streets and in the markets. I wouldn't mind coming back to Phnom Penh again to try more food and learn more about Cambodia's culture. I had a great time here. Almost every year, I go back to my hometown, Nhatrang for Tet (Lunar New Year) for at least a week to meet old friends, family and also to eat and relax. This year was a bit different compared to the last couple years because I had to work in between. It was very interesting wandering around with my clients and proudly talking about my hometown's amazing food. And for sure, I showed my clients all of my favorite places. Now they have some of my secrets. One of my favorite dishes is called Banh Can. I ate it many times during my 2 week holidays for both breakfast and dinner. I love the way they cook the cake with either egg or seafood or mixed together. There are a number of people who don't really like this dish very much but I think its kind of unique. 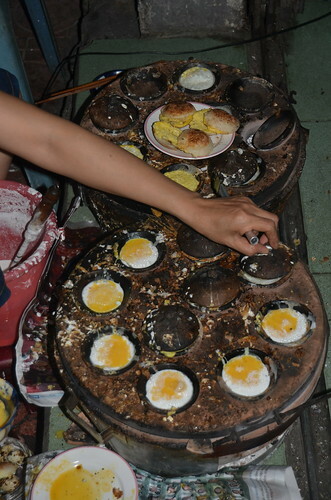 The rice flour batter is poured into little clay cups over a hot brazier, a quail egg is broken onto the top, sometimes a whisked chicken egg. Also I have enjoyed the cake with squid or shrimp steamed on it for a little while. 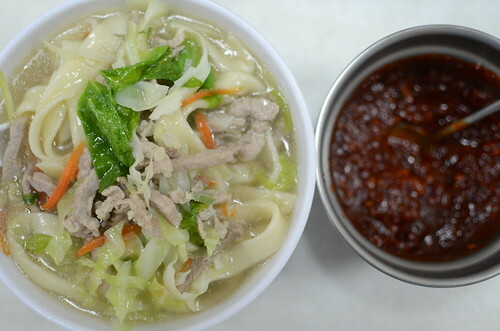 The dipping sauce can be a challenge for some people; but I love "Mam Nem" a fermented fish sauce with a milder flavor than "Mam Tom". Added to the sauce is shredded green mango, stir fried spring onion, chilli and minced pork balls are served on the side. I love the rich and spicy taste of the dipping sauce and the smokiness of the grilled cake in my mouth. It creates a great flavor combination. This dish is not available in Hanoi. Perhaps that's a good thing as I would probably eat far too much of it.